Thank you Berri! Top left on this 1993 'Art Objects' FDC is a lacquered wooden bowl from the Neolithic Hemudu Culture. 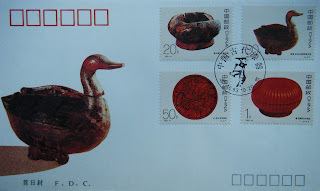 The lacquered wooden duck box on the UR stamp and cachet is from the Warring States Period. Thank you Ruonan! 1993 maxicard from the 4v 'Lacquerwares of Ancient China', with a wooden Neolithic red lacquer bowl.